This is a guess as there was a john Wilson in Rockbridge co, Va. petitioning for a road in 1752. MEMBERSHIP* 1876� She was a member in 1876 at Daughters of American Revolution, Cincinnati, Hamilton County, OH, of; Her Cincinnatti DAR number was 241 and her National DAR number was 17248. 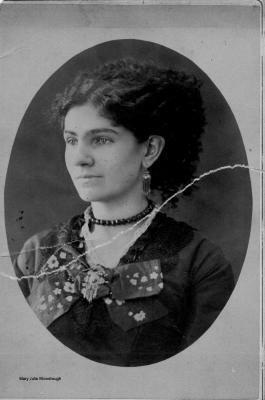 Mrs. Mary Julia Wilson Woodrough. Wife of James Richards Woodrough. Descendant of Andrew Wilson, John Wilson and Joseph James. Daughter of William Wilson and Hannah Wilson, his wife (nee Wilson). Granddaughter of John K. Wilson and Mary James, his wife; Joseph Pollock Wilson and Julia Anne Rhea, his wife. Gr.-granddaughter of Andrew Wilson and Lily Porter, his wife; Joseph James and Jane Woodward, his wife; Henry Rhea and Elizabeth Lions, his wife. Gr.-gr.-granddaughter of John Wilson and Jane Pollock, his wife. Andrew Wilson, (1761-1832), was placed on the pension roll of Butler county, Ohio, at the age of seventy-three, for service of a private in the Virginia State troops. He was born in Virginia and died in Ohio. John Wilson, (1739-1822), was a member of the Committee of Safety of Norfolk county. He was born and died in Virginia. Joseph James, (1760-1833), served as a private in the Pennsylvania Line and was wounded at Germantown. He was born and died in Pennsylvania. [S44] Cemetery Marker, Copy in MVW file on Woodrough, 100 Beach Dr. # 1801, St. Petersburg, Pinellas County, FL. [S43] Violet B. Jersey, "LDS Record", Annotation: In 1951 information was submitted to LDS regarding the Wilson/Woodrough family. It was based upon information of a Miss Isobelle Beardsley. The information was entirely accurate. It can be inferred that this Miss Beardsley was perhaps the child of one of the Wilson girls listed in the family. Perhaps she was the child of Isobelle Wilson (or her sister's child). Violet B. Jersey submitted the information to LDS and claimed to be a fourth cousin of the Woodrough family shown on her sheet. [S74] Unknown subject unknown repository. [S59] 1900 Census;, T 623 1281 Book ! Pg 287B. [S59] 1900 Census;, 31st ward T623 Microfilm 1281 Book 1 p. 287B. [S20] Williams, Cincinnati City Directory. [S518] 1930 Census;, She is living with her bachelor son. His occupation was listed as a stock salesman. [S56] 1880 Census;, Lives with his sister and her husband who manages the saw company. Death* 25 April 1900� On 25 April 1900 According to "Early Phases of St. Mary" he died while on a fishing trip. Same book says that E.J. Wimmer and F.A. Jacob took over management of St. Mary Herald in 1888. 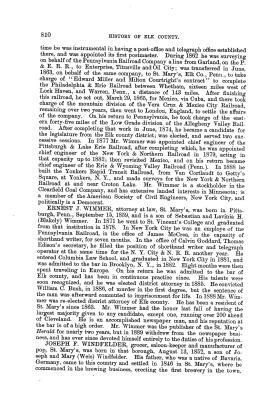 Employment circa 1895� Circa 1895 Served as District Attorney of Elk County according to his aunt's (Susan X. Blakely) obituary. See picture attached. [S16] Unknown author, Early St. Marys County, Book states that E. J. Wimmer and F. A Jacob took over management of St. Mary Herald in 1888. [S15] Unknown editor, History of McKean, Elk. Diary talks of his brother, Fr. Lucas of Caroltown. First diary talks about his brother George. St. Marys Daily Gazette, Monday, Jan. 17, 1949:BROUGHT HERE FOR BURIAL The body of John L. Wimmer, 50, who died in Philadelphia Friday, was brought here yesterday and taken to the Lynch Funeral home. Death* 14 January 1949� He died on 14 January 1949 at age 51 Jack DOD as Jan. 14, 1949 and he is buried at St. Marys Cem. Guess the Wimmer lot has more people in it than I thought! Note from Laura Glass Steneck. [S633] Debbie Wolfe, "Wimmer descendant," e-mail to unknown recipient, July 19, 2011.